Last few decades have seen changes in the approach toward the management of gallbladder cancer (GBCA). Availability of high-definition imaging modalities and accurate interpretations of their findings have helped in early and accurate diagnosis. A structured approach toward the disease with the aid of clinical, noninterventional/interventional radiology and laparoscopic findings has helped surgeons to choose between an aggressive approach of radical cholecystectomy for those with a resectable growth and suitable palliation for those who are unlikely to benefit from therapeutic laparotomy, thereby helping in proper and judicious utilization of health-care resources. Better understanding of the tumor biology is encouraging oncologists for trials with different targeted therapies in advanced disease. This review addresses some of the key issues related to the management of GBCA based on extensive search of available literatures and current international guidelines. The scenario has undergone a sea change over the last nine decades. The sense of despondency and nihilism has given way to greater interest and hope for treating the disease, mostly in view of early diagnosis, better understanding of the etiopathogenesis, advances in the imaging, widespread acceptance of laparoscopic cholecystectomy, more experience with major liver resections, and wider availability of interventional techniques for palliating symptoms of advanced disease. Long-term survival has now been reported following radical resection of large tumors invading the liver and also in patients who had previously undergone noncurative exploration. The key to better outcome is of course early diagnosis, accurate staging, and appropriate surgical intervention. The present review is written in this backdrop, incorporating the currently available guidelines regarding the management of this dreaded disease. Patients with GBCA may present to a clinician in either of the following ways: as an incidental histopathological finding following cholecystectomy done for chronic cholecystitis, incidental unexpected finding during surgery, GB mass detected preoperatively on imaging, and advanced cases with clinically apparent GB mass and jaundice. Some patients, in whom the diagnosis was missed during the initial histopathology, may present with locally recurrent tumor. One-fourth of the cases of GBCA presents as a polypoidal mass projecting into the GB lumen. These lesions are most likely to be limited to the GB mucosa and muscular layer and therefore picking them up early is prognostically important. USG can occasionally detect liver metastases/invasion, biliary or portal vein involvement, and enlarged lymph nodes. Gallstones are a common association being present in 75%–92% of cases, and those with stone size >3 cm have ten times more risk of GBCA than those with stones <1 cm.,, Although gallstone disease is prevalent in 10%–15% of adult population, only 0.5% of these patients develop GBCA over 20 years. GBCA occurring in the absence of stones has been associated with anomalous pancreatic bile duct junctions, chronic inflammatory bowel disease, and primary sclerosing cholangitis. Porcelain GB is not associated with an increased risk of GBCA as is the popular belief., Selective mucosal calcification, rather than diffuse intramural calcification, may be more closely associated with GBCA. An USG finding which is significantly common in GBCA is the discontinuity of the mucosal echo in association with a solitary stone within GB. Contrast-enhanced ultrasound has been evaluated in the characterization of GB lesions, though its potential remains to be clearly defined. Conventional transabdominal USG cannot assess the depth of invasion or T-stage, which directly correlates with the prognosis., It has also little role in N and M staging of the disease. However, endoscopic USG (EUS) can visualize in detail the layers of GB wall and has a diagnostic accuracy of 100%, 75.6%, 85.3%, and 92.7% for pTis, pT1, pT2, and pT3-4 growths, respectively. Moreover, the scope for EUS in the management of GBCA is likely to expand with time as more expertise are gained with interventional EUS, especially preoperative EUS-guided fine-needle aspiration cytology (FNAC) from interaortocaval (IAC) lymph nodes to detect metastasis, for avoiding nontherapeutic laparotomy. Polypoidal cancer appears denser than the surrounding bile and enhances homogeneously with administration of contrast. The role of fluorodeoxyglucose-positron emission tomography (FDG-PET) is still evolving. Its greatest advantage is that a larger area can be scanned with smaller radiation dose. In patients with incidental finding of carcinoma following cholecystectomy, PET-CT is useful in detecting local residual disease in GB fossa and nodal and distant metastases. It is also useful in postoperative follow-up to detect any recurrence. The only potentially curative therapy for GBCA is surgical resection. The depth of tumor invasion or the T-stage is the most important factor which determines the extent of surgical resection and also the prognosis. 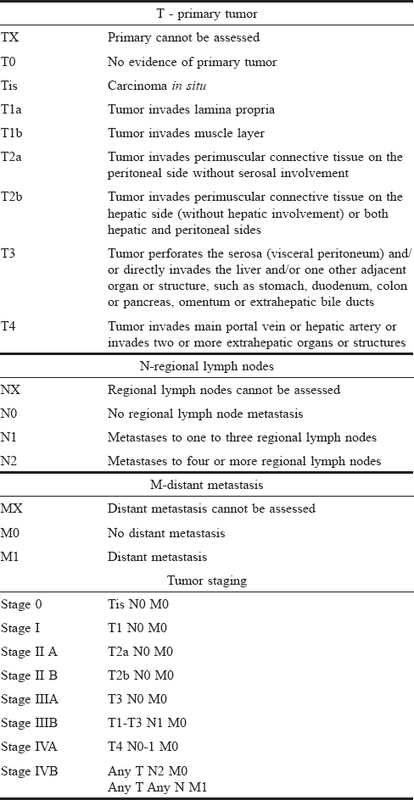 Broadly speaking, T1 and T2 tumors are limited to the GB wall, while T3 and T4 have extended beyond it. N1 lymph nodes are limited to the hepatoduodenal ligament and stage wise are potentially resectable, while patients having N2 disease are considered to have metastatic disease (M1). Other than the lymph nodes, the peritoneum and the liver are the other common sites of distant metastases. There is a direct correlation between the T-stage and the incidence of nodal and distant metastases., Stage wise, I and II are resectable with curative intent, Stage III is locally advanced and entails major resection, and Stage IV is unresectable because of distant hematogenous or lymphatic metastases, peritoneal implants, or invasion of major vessels such as celiac, superior mesenteric artery, aorta, or vena cava. Pathological diagnosis is required before any nonsurgical therapy, but it is not essential for patients with characteristic findings of resectable GBCA. Patients who after workup and SL, are found to have no metastatic disease are subjected to laparotomy. Perioperative confirmation of the SL findings is followed by sampling of IAC lymph nodes from below the level of left renal vein and its frozen section biopsy. If it is found to be negative, one proceeds for the radical surgery; otherwise, an attempt is made for a suitable palliation. The only treatment of potentially curative intent in GBCA is an aggressive R0 resection. Aggressive surgery entails radical cholecystectomy, which includes adequate lymphadenectomy and adequate liver resection along with en bloc resection of any involved viscera. Adequate lymphadenectomy means clearance of the lymph nodes and fibro fatty tissue in the hepatoduodenal ligament to the extent that bile duct and vessels therein are skeletonized; the hepatic artery is bared of nodes till its origin from celiac axis. Nodes anterior and posterior to the head of pancreas are also cleared. Anomalous pancreatic bile duct junctions and positive cystic duct stump on frozen section are indications for bile duct excision. Incidental GBCA encompasses patients who are diagnosed to be having GBCA either during cholecystectomy or on pathological review of the GB. Its incidence ranges from 0.5% to 2.1%.,,, In a series from Japan, its incidence is 27%–41% of all GBCAs. When the operating surgeon unexpectedly comes across a suspected malignant GB during laparoscopic cholecystectomy, he/she can either convert it to an open procedure and do a formal extended cholecystectomy if he/she has the expertise or abort the procedure without any attempt of resection or biopsy and refer the patient at the earliest to a hepatobiliary surgeon with the necessary technical expertise, thereby facilitating the first resection to be a definitive one and avoiding the harms of peritoneal/port-site dissemination or noncurative resection. On the other hand, when a patient presents to a hepatobiliary surgeon with pathology report of GBCA detected after a previous simple cholecystectomy, the T-stage of the lesion will aid him/her in selecting patients who would benefit from radical re-resection. For Tis and T1a tumors with negative resection margins and cystic node, the cure rate is 85%–100% without any further intervention. They need close follow-up radiologically and testing of carcinoembryonic antigen and CA19-9. T1a tumors with positive nodes and T1b tumors need re-exploration for adequate lymphadenectomy along with excision of segments IVb and V of liver (with a curative intent as well as for adequate staging) with or without bile duct excision depending on whether the cystic duct stump is positive or not. The 1-year survival drops down to only 50% for T1b tumors not undergoing radical excision. The patient must be counseled about the possibility of no residual disease in the resected specimen. One-third of the patients with T2 tumors will have regional lymphadenopathy., The same is true for >50% of patients with T3 tumors. Hence, cases with T2 disease must have a CECT to look for any residual disease or lymphadenopathy and those with T3 and above, a FDG-PET is preferable for the same. If there is no evidence of N2/M1 disease and the patient has an adequate liver reserve, he/she would benefit from a R0 resection including an anatomical bisegmental liver resection or a right/extended right hepatectomy, regional lymphadenectomy, and resection of adjacent involved structures with or without bile duct excision depending on the positivity of cystic duct margin., Radical R0 resection for T2 tumors is associated with 5-year survival of more than 80%, while the same for T3 tumors is 21%., On an average, 74% of the patients show residual disease on re-exploration and the median survival is far better (72 months) for patients who have no evidence of disease as compared to those with residual disease. Postoperative adjuvant gemcitabine and platinum-based CT and external beam radiotherapy should be offered to patients with poorly differentiated, aggressive T2, or higher, node/margin-positive lesions. Intensity-modulated radiation therapy is the newer technical advancement which allows highly conformal radiation delivery, sparing as far as possible the normal organs. Some believes that radical re-resection, if not otherwise contraindicated by the patient's status, may still be beneficial in terms of long-term survival even for T4 disease. Palliation for patients with jaundice before instituting chemotherapy. EUS/CT-guided fine-needle aspiration biopsy for establishment of pathological diagnosis is required before institution of palliative nonsurgical therapy. GB carcinoma has been associated with the mutations of KRAS, INK4a, p53 genes, and amplification of human epidermal growth factor receptor (EGFR), (HER)-2/Neu. Human EGFR mutations have also been identified. Targeted therapies may either prevent ligand binding and activation of EGFR or compete with ATP binding to tyrosine kinase domain, blocking downstream signal transduction, thereby affecting cellular activities such as transcription, differentiation, and apoptosis. It is likely that a particular population of patients of GBCA with EGFR mutations/overexpression might respond favorably to EGFR inhibitors as encouraging results have been documented with inhibitors such as gefitinib in patients of non-small cell lung cancers and pancreatic cancers with EGFR mutations. A Phase II study with a single agent erlotinib on patients with biliary tract cancers has shown promising results. Another randomized Phase II trial on patients of advanced cholangiocarcinoma and GBCA suggested the efficacy of cetuximab followed by gemcitabine plus oxaliplatin. The 8th edition of American joint committee on cancer (AJCC) staging system for gallbladder carcinoma is given in [Table 1]. The T2 category is separated into T2a (stage IIA) and T2b (stage IIB), based on tumor location on the peritoneal and hepatic sides of the gallbladder, respectively. This change is based on a recent study, demonstrating worse survival for tumors on the hepatic side of the gallbladder. The N category has be uniformly changed for gallbladder, perihilar bile ducts, distal bile duct, ampulla, and pancreas. N1 is defined as one to three metastatic lymph nodes, and N2 as four or more metastatic lymph nodes. A number-based categorization of metastatic lymph nodes results in better prognostic stratification. GBCA, if not resected, is rapidly fatal. Most Tis and T1a tumors are discovered incidentally following laparoscopic cholecystectomy and require no further treatment. Infiltration beyond T1a requires aggressive radical surgery for long-term survival. Adjuvant chemoradiotherapy for selective patients can be beneficial. Ongoing trials are suggesting that a subgroup of patients of GBCA with advanced and metastatic diseases might benefit from targeted therapies. Murthy NS, Rajaram D, Gautham MS, Shivaraj NS, Nandakumar BS, Pruthvish S, et al. Risk of cancer development in India. Asian Pac J Cancer Prev 2011;12:387-91. Kapoor VK. Advanced gallbladder cancer: Indian “middle path”. J Hepatobiliary Pancreat Surg 2007;14:366-73. Blalock A. A statistical study of 888 cases of biliary tract disease. Johns Hopkins Hosp Bull 1924;35:391-409. Fong Y, Jarnagin W, Blumgart LH. Gallbladder cancer: Comparison of patients presenting initially for definitive operation with those presenting after prior noncurative intervention. Ann Surg 2000;232:557-69. Gore RM, Shelhamer RP. Biliary tract neoplasms: Diagnosis and staging. Cancer Imaging 2007;7:S15-23. Goetze TO, Paolucci V. Adequate extent in radical re-resection of incidental gallbladder carcinoma: Analysis of the German registry. Surg Endosc 2010;24:2156-64. Furlan A, Ferris JV, Hosseinzadeh K, Borhani AA. Gallbladder carcinoma update: Multimodality imaging evaluation, staging, and treatment options. AJR Am J Roentgenol 2008;191:1440-7. Miller G, Schwartz LH, D'Angelica M. The use of imaging in the diagnosis and staging of hepatobiliary malignancies. Surg Oncol Clin N Am 2007;16:343-68. Hawkins WG, DeMatteo RP, Jarnagin WR, Ben-Porat L, Blumgart LH, Fong Y, et al. Jaundice predicts advanced disease and early mortality in patients with gallbladder cancer. Ann Surg Oncol 2004;11:310-5. Konstantinidis IT, Bajpai S, Kambadakone AR, Tanabe KK, Berger DL, Zheng H, et al. Gallbladder lesions identified on ultrasound. Lessons from the last 10 years. J Gastrointest Surg 2012;16:549-53. Gore RM, Yaghmai V, Newmark GM, Berlin JW, Miller FH. Imaging benign and malignant disease of the gallbladder. Radiol Clin North Am 2002;40:1307-23, vi. Gore RM, Thakrar KH, Newmark GM, Mehta UK, Berlin JW. Gallbladder imaging. In: Cynthia WK, editor. Gastroenterology Clinics of North America: Gallbladder Disease. Philadelphia: Saunders; 2010. p. 265-87. Venniyoor A. Cholesterol gallstones and cancer of gallbladder (CAGB): Molecular links. Med Hypotheses 2008;70:646-53. Contreras CM, Choi EA, Abdalla EK. Hepatobiliary cancers. In: Feig BW, Ching CD, editors. The MD Anderson Surgical Oncology Handbook. 5[th] ed. Philadelphia: Lippincort William & Wilkins; 2012. p. 416-71. Randi G, Franceschi S, La Vecchia C. Gallbladder cancer worldwide: Geographical distribution and risk factors. Int J Cancer 2006;118:1591-602. Stephen AE, Berger DL. Carcinoma in the porcelain gallbladder: A relationship revisited. Surgery 2001;129:699-703. Wibbenmeyer LA, Sharafuddin MJ, Wolverson MK, Heiberg EV, Wade TP, Shields JB, et al. Sonographic diagnosis of unsuspected gallbladder cancer: Imaging findings in comparison with benign gallbladder conditions. AJR Am J Roentgenol 1995;165:1169-74. Tsuji S, Sofuni A, Moriyasu F, Itokawa F, Ishii K, Kurihara T, et al. Contrast-enhanced ultrasonography in the diagnosis of gallbladder disease. Hepatogastroenterology 2012;59:336-40. Reid KM, Ramos-De la Medina A, Donohue JH. Diagnosis and surgical management of gallbladder cancer: A review. J Gastrointest Surg 2007;11:671-81. Agarwal AK, Kalayarasan R, Javed A, Sakhuja P. Role of routine 16b1 lymph node biopsy in the management of gallbladder cancer: An analysis. HPB (Oxford) 2014;16:229-34. Kim SJ, Lee JM, Lee JY, Kim SH, Han JK, Choi BI, et al. Analysis of enhancement pattern of flat gallbladder wall thickening on MDCT to differentiate gallbladder cancer from cholecystitis. AJR Am J Roentgenol 2008;191:765-71. Onoyama H, Yamamoto M, Takada M, Urakawa T, Ajiki T, Yamada I, et al. Diagnostic imaging of early gallbladder cancer: Retrospective study of 53 cases. World J Surg 1999;23:708-12. Kim JH, Kim TK, Eun HW, Kim BS, Lee MG, Kim PN, et al. Preoperative evaluation of gallbladder carcinoma: Efficacy of combined use of MR imaging, MR cholangiography, and contrast-enhanced dual-phase three-dimensional MR angiography. J Magn Reson Imaging 2002;16:676-84. Kumar R, Sharma P, Kumari A, Halanaik D, Malhotra A. Role of 18F-FDG PET/CT in detecting recurrent gallbladder carcinoma. Clin Nucl Med 2012;37:431-5. Agarwal AK, Kalayarasan R, Javed A, Gupta N, Nag HH. The role of staging laparoscopy in primary gall bladder cancer – An analysis of 409 patients: A prospective study to evaluate the role of staging laparoscopy in the management of gallbladder cancer. Ann Surg 2013;258:318-23. Weber SM, DeMatteo RP, Fong Y, Blumgart LH, Jarnagin WR. Staging laparoscopy in patients with extrahepatic biliary carcinoma. Analysis of 100 patients. Ann Surg 2002;235:392-9. Dixon E, Vollmer CM Jr., Sahajpal A, Cattral M, Grant D, Doig C, et al. An aggressive surgical approach leads to improved survival in patients with gallbladder cancer: A 12-year study at a North American center. Ann Surg 2005;241:385-94. Yoshikawa T, Araida T, Azuma T, Takasaki K. Bisubsegmental liver resection for gallbladder cancer. Hepatogastroenterology 1998;45:14-9. Reddy SK, Marroquin CE, Kuo PC, Pappas TN, Clary BM. Extended hepatic resection for gallbladder cancer. Am J Surg 2007;194:355-61. Shukla PJ, Barreto SG. Gallbladder cancer: We need to do better! Ann Surg Oncol 2009;16:2084-5. Toyonaga T, Chijiiwa K, Nakano K, Noshiro H, Yamaguchi K, Sada M, et al. Completion radical surgery after cholecystectomy for accidentally undiagnosed gallbladder carcinoma. World J Surg 2003;27:266-71. Yamaguchi K, Tsuneyoshi M. Subclinical gallbladder carcinoma. Am J Surg 1992;163:382-6. Jayaraman S, Jarnagin WR. Management of gallbladder cancer. In: Cynthia WK, editor. Gastroenterology Clinics of North America: Gallbladder Disease. Philadelphia: Saunders; 2010. p. 331-42. Anderson CD, Rice MH, Pinson CW, Chapman WC, Chari RS, Delbeke D, et al. Fluorodeoxyglucose PET imaging in the evaluation of gallbladder carcinoma and cholangiocarcinoma. J Gastrointest Surg 2004;8:90-7. Pawlik TM, Gleisner AL, Vigano L, Kooby DA, Bauer TW, Frilling A, et al. Incidence of finding residual disease for incidental gallbladder carcinoma: Implications for re-resection. J Gastrointest Surg 2007;11:1478-86. Hueman MT, Vollmer CM Jr., Pawlik TM. Evolving treatment strategies for gallbladder cancer. Ann Surg Oncol 2009;16:2101-15.
de Aretxabala X, Roa I, Burgos L, Araya JC, Fonseca L, Wistuba I, et al. Gallbladder cancer in Chile. A report on 54 potentially resectable tumors. Cancer 1992;69:60-5. Duffy A, Capanu M, Abou-Alfa GK, Huitzil D, Jarnagin W, Fong Y, et al. Gallbladder cancer (GBC): 10-year experience at memorial Sloan-Kettering Cancer Centre (MSKCC). J Surg Oncol 2008;98:485-9. NCCN Clinical Practice Guidelines in Oncology: Hepatobiliary Cancers. Version 2; 2015. Valle J, Wasan H, Palmer DH, Cunningham D, Anthoney A, Maraveyas A, et al. Cisplatin plus gemcitabine versus gemcitabine for biliary tract cancer. N Engl J Med 2010;362:1273-81. Wang SJ, Lemieux A, Kalpathy-Cramer J, Ord CB, Walker GV, Fuller CD, et al. Nomogram for predicting the benefit of adjuvant chemoradiotherapy for resected gallbladder cancer. J Clin Oncol 2011;29:4627-32. Zhu AX, Hong TS, Hezel AF, Kooby DA. Current management of gallbladder carcinoma. Oncologist 2010;15:168-81. Maker AV, Butte JM, Oxenberg J, Kuk D, Gonen M, Fong Y, et al. Is port site resection necessary in the surgical management of gallbladder cancer? Ann Surg Oncol 2012;19:409-17. Eckel F, Brunner T, Jelic S; ESMO Guidelines Working Group. Biliary cancer: ESMO clinical practice guidelines for diagnosis, treatment and follow-up. Ann Oncol 2011;22 Suppl 6:vi40-4. Rashid A, Ueki T, Gao YT, Houlihan PS, Wallace C, Wang BS, et al. K-ras mutation, p53 overexpression, and microsatellite instability in biliary tract cancers: A population-based study in China. Clin Cancer Res 2002;8:3156-63. Lynch TJ, Bell DW, Sordella R, Gurubhagavatula S, Okimoto RA, Brannigan BW, et al. Activating mutations in the epidermal growth factor receptor underlying responsiveness of non-small-cell lung cancer to gefitinib. N Engl J Med 2004;350:2129-39. Philip PA, Mahoney MR, Allmer C, Thomas J, Pitot HC, Kim G, et al. Phase II study of erlotinib in patients with advanced biliary cancer. J Clin Oncol 2006;24:3069-74. Paule B, Herelle MO, Rage E, Ducreux M, Adam R, Guettier C, et al. Cetuximab plus gemcitabine-oxaliplatin (GEMOX) in patients with refractory advanced intrahepatic cholangiocarcinomas. Oncology 2007;72:105-10. Zhu AX, Meyerhardt JA, Blaszkowsky LS, Kambadakone AR, Muzikansky A, Zheng H, et al. Efficacy and safety of gemcitabine, oxaliplatin, and bevacizumab in advanced biliary-tract cancers and correlation of changes in 18-fluorodeoxyglucose PET with clinical outcome: A phase 2 study. Lancet Oncol 2010;11:48-54. El-Khoueiry AB, Rankin C, Ben-Josef E, Lenz HJ, Gold PJ, Hamilton RD, et al. A phase II study of sorafenib (BAY 43–9006) as single agent in patients (pts) with unresectable or metastatic gallbladder cancer or cholangiocarcinomas. Proc Am Soc Clin Oncol 2007;25:4639. Amin MB, Edge SB, Greene FL, Byrd DR, Brookland RK, Washington MK, et al., editors. AJCC Cancer Staging Manual. 8th ed. New York: Springer; 2017. Shindoh J, de Aretxabala X, Aloia TA, Roa JC, Roa I, Zimmitti G, et al. Tumor location is a strong predictor of tumor progression and survival in T2 gallbladder cancer: An international multicenter study. Ann Surg 2015;261:733-9.